The 'Chairman', as he's now known, hangs in the Newsfield boardroom. 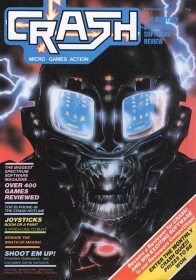 This first cover of CRASH was not based on any particular game, but took its inspiration from the chrome-teethed, machine-oil-dripping alien from the film Alien. It's really a simple gag - an alien playing Space Invaders, the screen reflected in his eyes. The object was to provide a striking and ferocious image to leap off the news shelves, and to declare to the world that CRASH was very different to existing computer magazines with their reliance on photographed hardware. Work started on the first issue of CRASH well before Christmas 1983. The editorial team, which was to remain unchanged for three months, consisted of Roger Kean, Oliver Frey, Lloyd Mangram and Matthew Uffindell, a 17-year-old who had been buying software from Crash Micro Games Action mail order. As he lived nearby, he popped in to purchase games and somehow never quite left. Many of CRASH's early reviewers were recruited in this fashion. Matthew now works in Newsfield's art department as a senior film planner - one of the people who put the images on film, ready for the printers. At the 1983 PCW Show, held at the Barbican that year, Roger Kean and CRASH financial director Franco Frey roved around the stands trying to convince software houses that a really new magazine was about to arrive. Interest was generally luke warm, but nevertheless, by mid-December when the issue had to be ready, 27 pages of advertising had been sold - enough to provide CRASH with the funds to print! Issue One had lots to offer, including an amazing 60 reviews, the first time ever so much space had been devoted to Spectrum games. Among them were notables like Zaxxan from Starzone, a bunch of youngsters who later got into a legal wrangle with US Gold when the official version of Zaxxon was released, Bugaboo (The Flea) from Quicksilva, which got 92% and would have been a Smash had there been Smashes in those days, and of course the Game of the Month, Micromega's 3-D Deathchase - still a great thrill to play. Programming innovations were still largely a thing of the future, but Sandy White's Ant Attack (Quicksilva) raised some eyebrows, although I remember Matthew and I feeling that it lacked something in the gameplay.